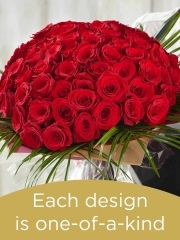 Aberdeen Flowers are proud to offer you our Luxury Flower Collection. Our expert florists in Aberdeen have designed this stunning collection of flowers using some of the most beautiful flowers, creating beautiful flowers fit for any occasion. These gorgeous arrangements use only the best flowers including lillies, roses and various varieties of orchids. Every floral arrangement is then presented in either glassware, vases, or various types of hatboxes ensuring that each bespoke arrangement gives that WOW effect. Aberdeen Flowers florists create each arrangement using only the freshest flowers which can then be delivered in Aberdeen, Scotland and throughout the UK. We personally deliver in the North East of Scotland and with our network of florists we can deliver in the UK and even abroad in over 140 countries worldwide. Our Luxury Flower Collection is truly stunning with every one of our arrangements wrapped beautifully and tied with ribbon. We then personally hand write every card. Our expert florists in Aberdeen deliver your flowers in water to ensure that they will last so you can enjoy their beauty for longer. Every single arrangement is made to order and at Aberdeen Flowers we take pride in ensuring your flowers arrive in only the best condition. 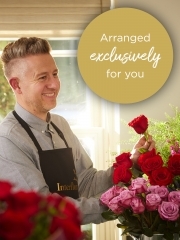 Our Aberdeen Florists carefully assemble your Luxury Flowers from the best flowers which we have imported from Holland several times a week to ensure that every flower we use is absolutely fresh so that every arrangement will be as beautiful and last as long as possible. Aberdeen Flowers will make sure that you are never disappointed as we pride ourselves on the excellent quality of our flowers and the care with which we treat them, from the moment you place your order to the time you specify for delivery. Our careful Aberdeen Flowers drivers will ensure that your arrangements arrive in the best condition possible. We want you to be thrilled with your arrangements from Aberdeen Flowers so we make every effort to ensure that this happens. Aberdeen Florists love delivering your flowers because we enjoy putting smiles on the faces of your recipients who will always be delighted to receive our gorgeous arrangements. As well as flowers our Aberdeen Florists can have gift items delivered on your behalf. We offer such items as champagnes, balloons and chocolates, all of the best quality, which can be a great complement to your beautiful Aberdeen Flowers arrangements. All of these optional gift items can be delivered with your flower arrangements right to your recipient’s front door and will arrive in pristine condition because we consider your needs our top priority. 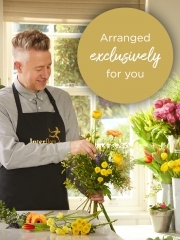 Because we want your flowers to be exactly what you envisage, we offer a bespoke service which allows you to specify every detail of the flowers you want to order to that our Aberdeen Florists know exactly how to create the arrangement of your dreams. We make this service available to you because we at Aberdeen Flowers know just how personal you want your flower arrangements to be, whatever the occasion or reason for giving them, and we want to enable this so that your flowers will be ideal for your recipient’s tastes. For any further information please contact Aberdeen Flowers online, over the phone or in our shop, and one of our Aberdeen Florists will be available to help you.